>Smart Stories>Markets, Strategy>Still an EMS leader! 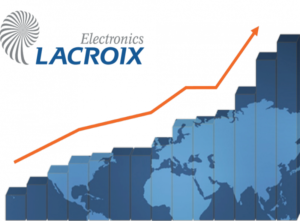 Among the most successful Electronics Manufacturing Services companies, LACROIX Electronics was recently listed as one of the ten most dynamic electronics industrial companies in the world, with a growth rate averaging in the two-figure range between 2012 and 2017! Firmly rooted and recognised in each of our lines of business, every day we solidify our positioning in the automation and digitization of the industrial world. Although the electronics industry has been experiencing constant growth for several decades, there is still fierce competition between the main players in a sector where thousands of companies engage a merciless battle every day. With a turnover of 317 million Euros in 2017 and an average annual growth of 10.6% – twice the market’s growth, we are consolidating, for the fifth year in a row, our position as a major player in automotive, aeronautical and industrial electronics. This increase is even more gratifying for our teams as it is the result of purely organic growth, without any acquisitions. Over the past five years, we have not only been steadfast in our conquest of new market shares, we have also demonstrated our ability to be agile and flexible in supporting all of our customers and partners with solutions that suit their ongoing modernisation requirements. With the dawn of worldwide digitization, we choose to focus on the automation and digitization of production tools with an eye to fostering our industrial performance and providing our customers with even better service. Our factories, strategically located in France, Germany, Poland and Tunisia, as well as our North American alliance with Firstronic represent, due to their complementary nature, a true competitive advantage for LACROIX Electronics. At LACROIX Electronics, we consider productive forces as a whole and do not limit our investments to the production apparatus. Since 2012, we have hired more than 1,000 new recruits for a total staff of over 3,000 employees in 2017. However, operational excellence in itself is not enough to account for such great success. We are proud to having created, with our network of suppliers and partners, an ecosystem that encourages mutual development by associating mainly with market leaders. Today, we are proud to see sustained double-digit growth, and we are even more pleased to be able to rely on the support of our suppliers and partners, which is absolutely necessary to our success and its continuation.